A Castle on Viola Street tells the story of a family who volunteers to refurbish homes for Habitat for Humanity and ends up receiving a home of their own from the organization in the end. (Habitat for Humanity is a real non-profit organization that builds and refurbishes homes for poor families across America.) 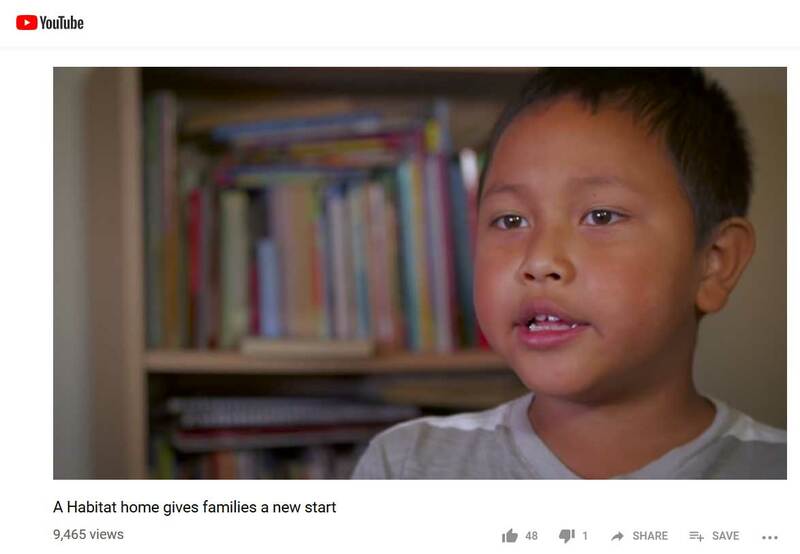 In this story, Andy and his family live in a cramped apartment and dream of owning their own home. 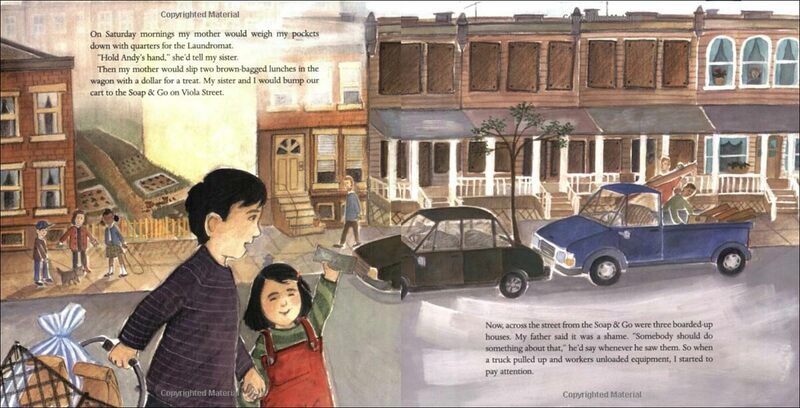 Then, one day while at the Laundromat, Andy and his sister see a flyer for a Habitat for Humanity project across the street. Before long, the whole family is involved with the organization, volunteering to fix up homes for other needy families. They hope that someday they will be the chosen family to receive a home, but happily help restore homes for other families in the meantime. Finally, the last spread says that work will begin next Spring on a house for their family! 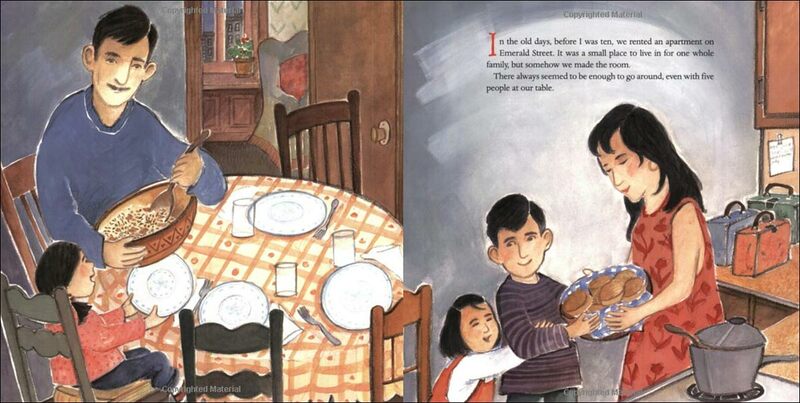 Beyond providing a window into the work of Habitat for Humaity, this picture book also does a good job of showing what can happen when people come together and perform acts of service in their community. Viola Street used to full of dilapidated buildings and many residents were cynical that anything could change. 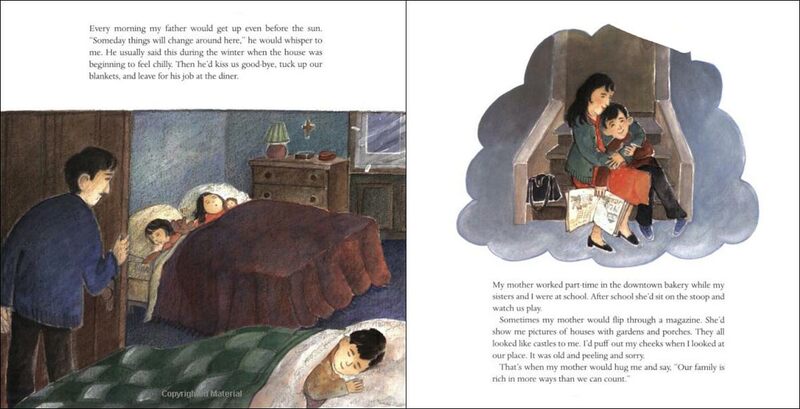 By the end of the book, "things were really chaniging on Viola Street." 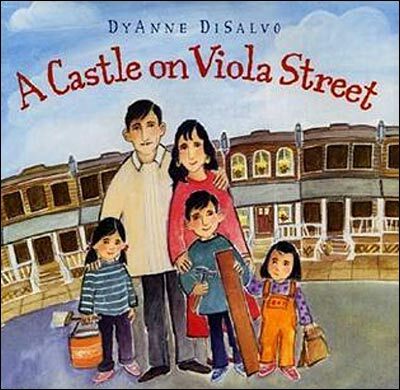 We especially appreciate that DiSalvo did not emphasize the family getting their own home too much. Instead, she showed the joy that came to the family as they helped others in their community achieve their dreams. That helps reinforce for chilren the joy that can come from selfless service. Below are the first three spreads from inside A Castle on Viola Street, to give you an idea of the illustration style. Extension Activity: After reading A Castle on Viola Street to your class or child, we recommend that you explain that Habitat for Humanity is a real organization and share some of the interesting facts that are provided in the front of the book (in a letter from the founder and president of the organization.) Many children will not have heard of this organization and will be delighted to discover that this picture book story represents thousands of true stories happening across the nation.